Dressed as one of Jabba the Hutt’s slaves, Princess Leia escapes from the Hutt’s sail barge at the Pit of Carkoon. Re-create the biggest battles and missions in the Star Wars epic with figures from The Black Series! This 6-inch figure is carefully detailed to look like Princess Leia when she was enslaved by Jabba the Hutt and escaped. Act out your favorite Star Wars battles or create brand new ones! Your collection – and your adventures – won’t be complete without this Princess Leia (Slave Outfit) figure! Star Wars products are produced by Hasbro under license from Lucasfilm Ltd. Hasbro and all related terms are trademarks of Hasbro. Experience the fun and satisfaction of building your own iconic Star Wars Slave I with this Revell SnapTite model kit. No glue or paint needed! Just snap the pre-decorated pieces together and have a real life Star Wars replica in no time, complete with full authentic details. This kit includes movable wings and laser canons, plus a pilot figure. Product is intended for ages 8 and up. 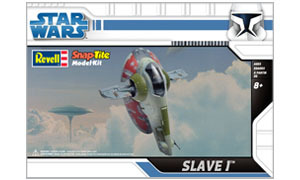 The SnapTite Slave I sure to please kids, hobbyists, and Star Wars fans. Model building is a great way to develop learning skills and increase dexterity. 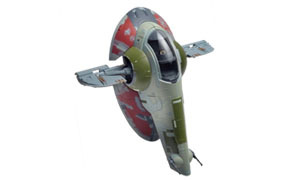 The Slave I served up until the Clone Wars as the transport for bounty hunter Jango Fett. After his death, his son Boba Fett, also a bounty hunter, modified and repainted the Slave I and used it to track down and capture his quarry. Boba Fett’s Slave I, in which the icebound Han Solo was also transported, has holding cells, a dedicated tracking system, much improved deflector shields, a massive Class 1 hyperdrive engine and numerous well concealed weapons systems. A particular feature of this starship is its vertical flight even at a speed fully comparable to that of the Y-wing fighter. Although the Slave I appears antiquated, Boba Fett rebuilt and improved the craft originally developed by Kuat Systems Engineering to suit his needs. This included the extensive armament, including twin blaster cannon, ion cannon, tractor beam projector and proton torpedoes. Its illegal sensor-masking and jamming systems enable the Slave I to slip undetected through closely meshed sensor grids. Your Slave I is a Level 1 kit – it’s perfect for anyone new to model kit building, as well as experienced builders. Always study the assembly drawings included in the packaging before beginning. Each plastic part is identified by a part number. This kit may be snapped together, but for extra stability, you may want to cement or glue the parts as well. Trimming to remove extra plastic and filing to smooth before part assembly is suggested. If you’re looking to take the next step in model building, don’t miss any of the Revell glue model kits – like the Revell Star Wars®Republic Star Destroyer Model Kit. 33 pre-decorated, snap together parts and fully detailed instructions. Incredible detailing gives you a model you’ll be proud to show off.